If you think the -2.2% loss Conoco Phillips (COP) took yesterday was a nasty hit, that was nothing compared to the -8% drubbing the crude oil market took. If a rising tide lifts all boats, crude oil has been the Kraken that pulls them down into the abyss. That may be a little dramatic, but the crude selloff hasn’t done much to help the stock market lately (it arguably helped torpedo yesterday’s rally), and it’s certainly hit oil stocks where it hurts: Energy is the weakest S&P 500 sector over the most recent five days as well as the past month, off more than 10%. Oil declined for a record 12th straight day yesterday, following up on Monday’s 4.7% loss with a 8% implosion that dropped the market below $55/barrel for the first time in a year. COP’s drop yesterday punctured the bottom of a roughly three-week rebound/consolidation following its October 24 low of $65 (chart above). The stock's action is representative of most high-profile oil names—Exxon-Mobil (XOM), Chevron (CVX), etc.—all of which have retreated in the face of crude’s collapse. In this type of environment, it’s fair to say stock specifics take a back seat to the commodity catalyst, which is another way of saying energy stocks probably won’t catch a breather until crude stops the bleeding. But with Saudi Arabia at least floating the idea of production cuts1 and crude oil futures approaching the support of their January 2017 highs in the low-to-mid $50s, there may be some hope for a turnaround, if not a reversal. 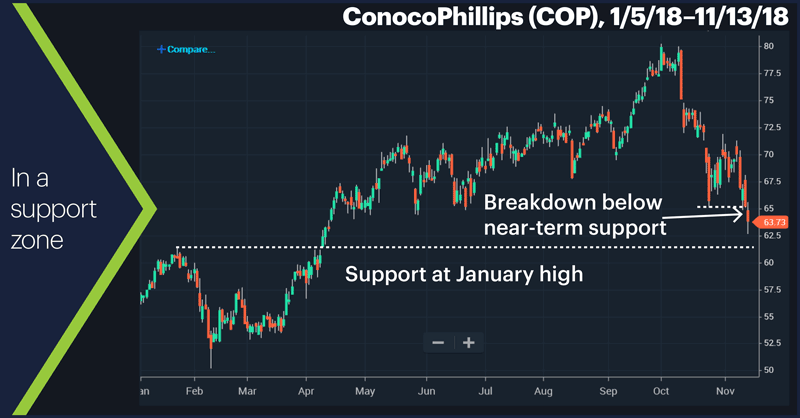 In that case, bulls may take note that COP, for example, although it broke below support, is coming close to another support level—its January high—and it also rallied off yesterday’s low even as crude continued to slip. Tomorrow things could look different, but as of yesterday, the move had the appearance of a potential bear trap. At some point crude will find its bottom. When it does, COP and other oil stocks could be in for some slick moves of their own. Today’s numbers: Consumer Price Index (CPI), 8:30 a.m. ET. Today’s earnings include: Macy's (M), Weibo (WB), Cisco Systems (CSCO), Copa Holdings (CPA), NetApp (NTAP), NetEase (NTES), Williams-Sonoma (WSM). Which FAANG could have the most bang?